Randy saw our post when he was searching for the same PBK puppy. He had found a source and was kind enough to write with all the information. After writing Desiree, we received this joyous news. Yes, great news!! I called the store and ordered three! I also emailed Randy and thanked him! Thank you for this service you provide, and I’ll make sure I check back often to scroll through the missing loveys in case I can be of help to anyone else- I’ll try to Pass It On!! He was purchased for us as a gift in Summer of ’07 from either Pottery Barn Kids or the Pottery Barn outlet. I’ve tried contacting Pottery Barn but without the receipt there’s nothing they can do. There is no id number on Charlie’s tags. He is in bad shape already and I hesitate to wash him too often. I am looking for a backup because the thought of losing him makes me sick to my stomach! I still have my lovey from childhood and I want to make sure my son always has Charlie! Thank you so much for what you do!! 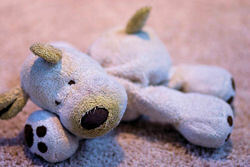 My son Michael has one of these and I found your story when I was looking for a replacement as his is starting to get worn as he takes “puppy” everywhere with him and can’t sleep without him. I did not think they would that hard to find, I guess I was wrong! Well fortunately my wife keeps all receipts (its a blessing, really). Well, she was able to find the receipt from when we bought “puppy”. We called the catalog/customer service number and they told us they had never stocked that model number and it was a store only item. The lady then told me that she could check a local store, but none of the local stores had them. She then told me if I didn’t mind paying shipping, she could check nationally — of course the UPS shipping was not going to stop me at this point. Anyway, as it turns out we struck GOLD!! There was a store that the computer system showed has 20 of them in stock. I have removed the information until Desiree has a chance to contact me at randyw AT gmail DOT com. Once I have been able to confirm Desiree is able to order the item, I will post the needed info to help others obtain their own “charlie” or “puppy”. Thank you so much for providing the information, Randy. I received a copy of your first comment, so I have already emailed Desiree with your information. And I sent her email address to you, too. It was very considerate of you to delete the info until she had time to call them. Hooray for Randy, our Fabulous Finder!!! I’ve been searching online for days trying to find this guy for my little guy. We’ve named our Tobias, and he can’t go anywhere without him. If there’s anyway anyone out there is able to assist in locating another (new or used) I would greatly appreciate it. I sent you the contact information along with the stock number so hopefully you can get a new Tobias for your little guy. I really hope it works out for you with all the time that has past since my last post on this site!! Hi! My son has this exact same PBK puppy that we received as a gift when he was a baby. He can't sleep without it at night, and he's having trouble transitioning into his new room at daycare, so I thought it might help if he had a spare (or two, just in case!) to get him over this rough patch. Any idea if there are any still available? Please feel free to e-mail me at ljleditingATcomcastDOTnet – thanks so much!